El Calafate is located 320 km Northwest of Río Gallegos, the capital city of Santa Cruz province. It is renowned for being the entrance to Los Glaciares National Park. The name is derived from a prickly little bush, Berberis microphylla, with yellow flowers and dark blue berries, typical of Southern Patagonia. Climate is cold and dry, with not much variation in temperature during the year. Average temperature in January is 13°C (55°F), rarely reaching 28°C (82°F). Average temperature in July is 1°C (33°F) with absolute lows of -12°C (10°F). Precipitation is about 150 mm (60 inches) per year. Due to the proximity to Lakes Argentino and Viedma and its strategic location, the city of El Calafate is the hub of the tourist activities in the region, both inside and outside of Los Glaciares National Park. The town of El Calafate is located 321 km from Río Gallegos, in the southwestern area of the province of Santa Cruz. It can be reached from the North and by the coast, on the eastern side of the province, through National Road # 3, and then Provincial Roads # 5 and # 11 (fully paved). From the west, take National Road # 40 (gravel road) bordering the Andes, then take Provincial Road # 11 (paved). Towards the south, El Calafate connects to Río Turbio and border crossings Cancha Carrera-Retén El Castillo or Mina Uno-Retén Dorotea, which link the village to Torres del Paine (Chile), through Road # 40. 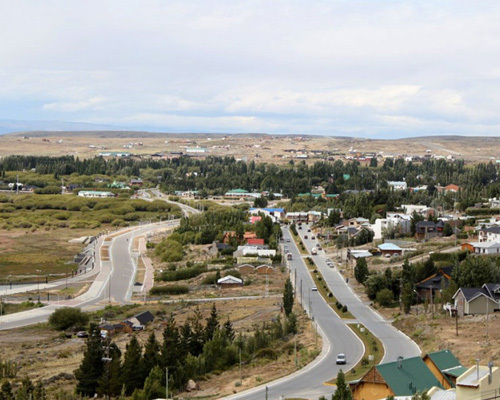 The town offers regular land transportation services from/to Río Gallegos, El Chaltén and Chile. The modern El Calafate international airport (IATA code: FTE), 23 km (14 miles) east of the city, close to Provincial Road # 11, has daily flights to Buenos Aires, Ushuaia, Trelew, and Bariloche.